We were back at Europe’s biggest broadcasting convention in September – demonstrating how Blue Lucy and the BLAM tackle media operations management bottlenecks and enable new opportunities from our usual spot in Hall 7 of the IBC Show. We had a packed schedule with a record number of bookings being made in the run-up to the event, possibly a benefit of the show being held over the 3rd weekend in September. However, the show felt quiet in terms of footfall and big announcements, certainly on the, hitherto ceaseless, M&A front. In technology obviously lots of cloud – some of it real – but the stand-out was certainly the SMPTE approvals of standards within the 2110 envelope. The approval of many of these standards will mark the tipping point for content over IP. Standardisation affords assurance which should drive investment. Back to the operational matters: Our big reveal at this year’s show was BLAM-in-a-Can – a series of six pre-packaged MAMs for quick deployment across a range of operational use cases, from content supply chain management to post production. We also showed a number of new BLidgets – the building blocks behind the Blue Lucy Asset Manager’s workflow capability that provide management control of Blue Lucy plug-ins and access to 3rd party software and services. What the difference between MAM (media asset management) and MOM (media operations management) is and where the Blue Lucy Asset Manager fits in. What BLidgets are and how they provide users with unprecedented flexibility from a MAM product. What flavours of BLAM-in-a-Can are available and who they’re targeted at. 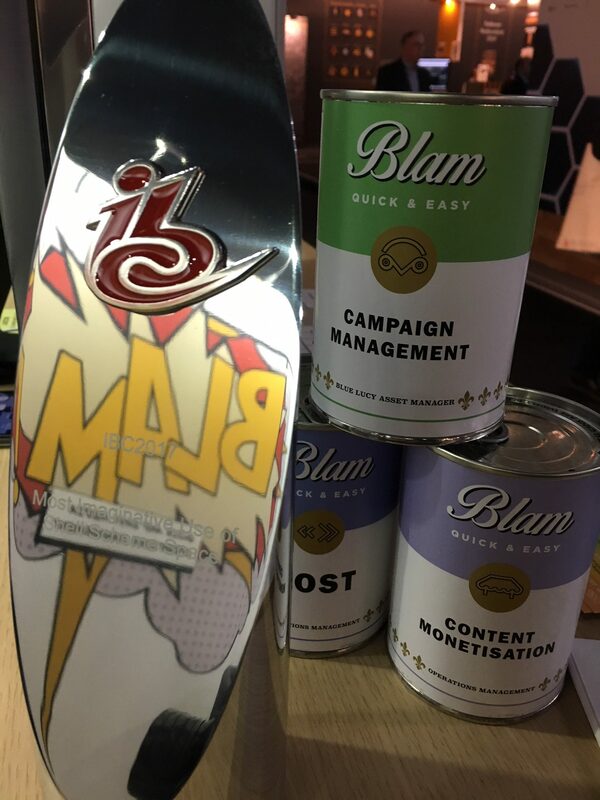 Did we mention that we won an IBC Award? We weren’t great believers in industry awards, until we won one. Each year IBC gives three awards for the most attractive, practical and effective exhibitions stands at the show and Blue Lucy was awarded the Best Use of Shell Scheme Space trophy for our “fun and eye-catching [pop art inspired] graphics.” With over 1700 exhibitors, spanning across 15 halls, we’re quite pleased that our stand stood out from the crowd. Candice of Little Cricket PR for convincing us the Pop Art idea from Matt at Heavylight Design was a good one, Matt and Dickie of Heavylight Design for the concept and final designs, Clem and team at CoreModular for the reproduction and installation and finally the IBC Awards Judges, you know who you are, for excellent tastes.